Menopausal weight gain affects many women during perimenopause. A combination of factors, including a slowing metabolism, thinning muscle tissues, and a redistribution of body fat means you may notice extra pounds creeping around your midsection during your forties and fifties. The most effective way to shed those pounds is adjusting your diet; 80% of weight control is determined by what you eat. Adding a few extra healthy herbs to you diet can also help some women shed the pounds a little faster. Drinking green tea can improve metabolism by countering age-related slowing metabolic rates. The flavonoids in green tea increase metabolism, and herb's caffeine content helps to suppress appetite. Many diets avoid fat, even though fat has many important functions, including making cell membranes. The key is to avoid saturated fats, which can contribute to weight gain and cardiovascular disease. Coconut contains a type of healthy fat called medium-chain triglycerides, which help the body burn more energy. Coconut can be a great addition to a weight loss diet. Ginseng has been used for centuries in traditional medicine to treat a host of ailments, but the herb's ability to alter how glucose is metabolized renders it useful for weight loss. This is especially true for individuals with insulin resistance. Amazonian tribes traditionally used acai berries to boost metabolism, although research on this is limited. Acai is also an excellent source of antioxidants, compounds that can reduce cellular wear and tear by neutralizing free radicals. The San Bushmen in Africa traditionally used Hoodia stems to suppress appetite for weight loss, and is still used that way as a supplement. Although there are few studies on hoodia, some reports confirm the herb is an appetite suppressant, which could help you control binge eating urges. However, this isn't a long-term or sustainable form of weight loss, and should be used with caution. Supplements of Citrus x aurantium, known as bitter orange, could help prevent weight gain during menopause. Preliminary studies have indicated it can assist with weight loss by increasing metabolic rate over time, which could improve how your body burns calories long term. While promising, bitter orange has not undergone any safety testing, so consult your physician before incorporating it into your weight loss plan. Macafem is a natural supplement that regulates hormones, and can help reduce weight. It can help alleviate health disorders related to hormonal imbalance. It doesn't contain estrogen, yet still relieves menopause symptoms and while promoting healthy sexual function and weight loss. 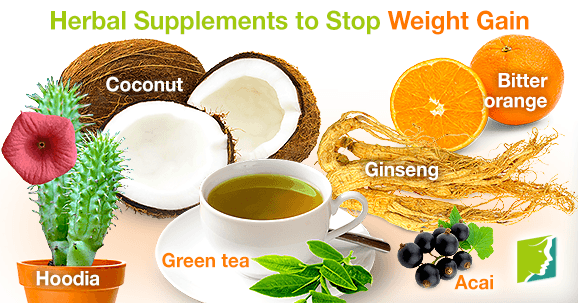 Herbal supplements aren't miracle cures for weight gain; eating a healthy, balanced, diet, drinking plenty of water, and exercising are the most effective ways to treat weight gain long term. However, incorporating the right supplements into your diet could maximize the effects of your diet plan and help combat weight gain more effectively. If menopause gifted you with extra pounds this year, you're not alone. Try these three healthy tips to get your best body back! Weight gain is a common symptom of menopause. However, it is important to find the motivation to lose excess weight.